More than ever before we’re consuming news in strange contexts; mixed into a stream of holiday photos on Facebook, alongside comedians’ quips on twitter; between Candy Crush and transit directions on our smartphones. In this environment designers can take liberties with the form of the news package and the ways that audiences can interact. But it’s not just users who are invited to experiment with their news: in newsrooms and product development departments, developers and journalists are adopting play as design and authoring process. 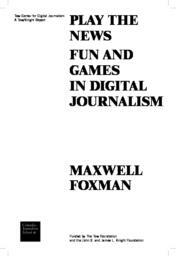 Maxwell Foxman‘s new Tow Center report, Play The News: Fun and Games in Digital Journalism is a comprehensive documentation of this world.